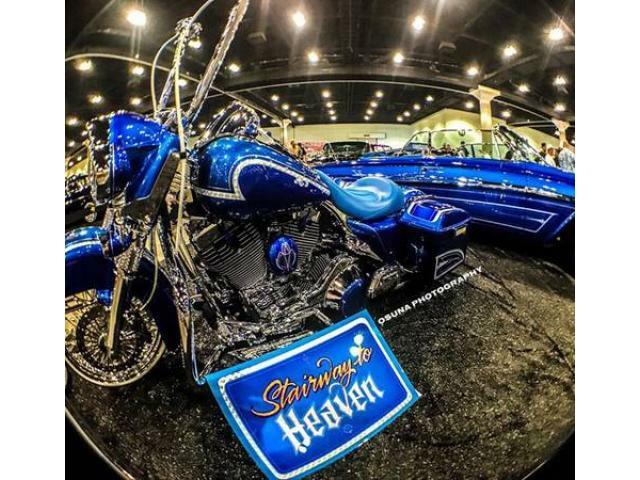 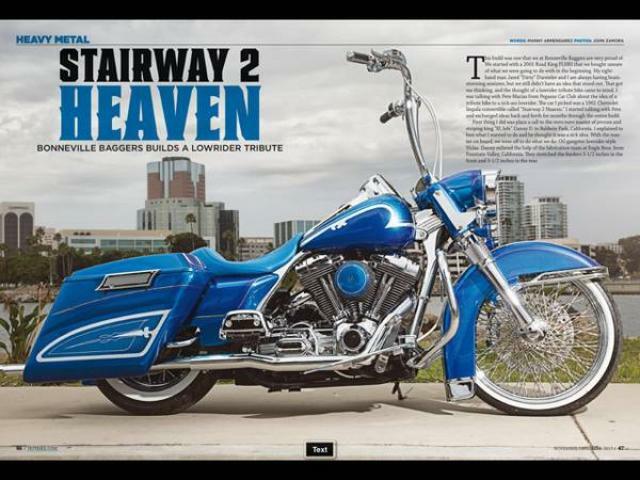 BONNEVILLE BAGGERS NEWEST BUILD STAIRWAY 2 HEAVEN UP FOR SALE HAS JUST BEEN FEATURED IN 2 MAJOR MAGAZINES LOWRIDER MAGAZINE & HOTBIKE MAGAZINE NOV DEC ISSUES U CAN FIND ONLINE. 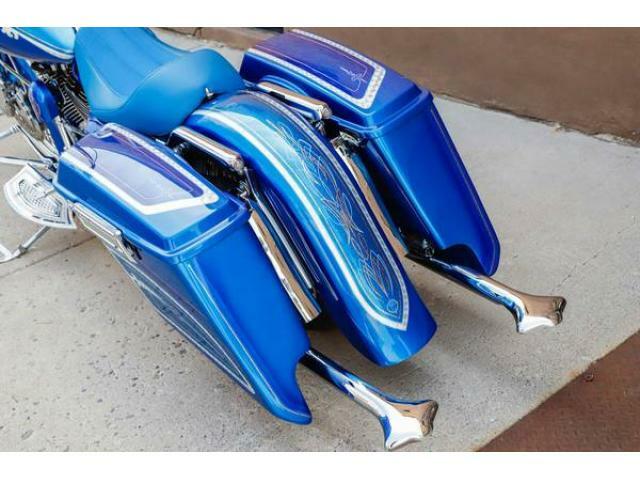 THIS BIKE HAS BEEN COMPLETELY REBUILT NEW THIS IS A 100% SHOW QUALITY BIKE IF U HAVE ANY QUESTIONS PLEASE FEEL FREE TO CALL. 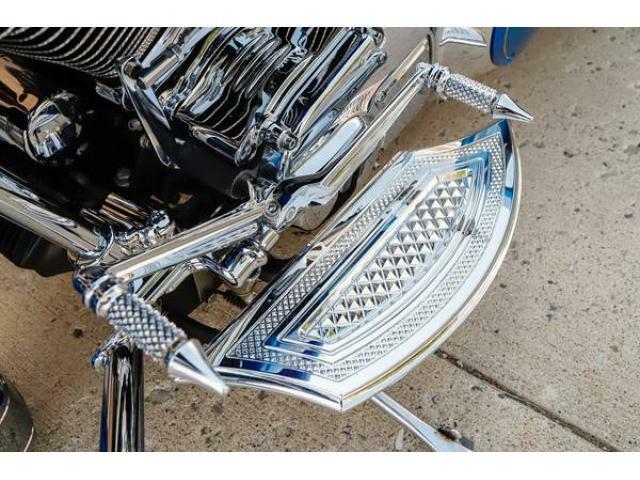 2001 HARLEY DAVIDSON ROADKING FLHR THIS A HAS A FRESH BUILT ENGINE WITH PORTED HEADS DIAMOND CUT BARRELS AND HEADS ALL THE CHROME U CAN IMAGINE TRUE DUAL HEADERS AXLATA CANDY DANNY D PAINT JOB WITH CUSTOM MADE ONE OFF 42" CLAMSHELL EXHAUST WITH 18' CARLINI GANGSTER APES WITH ARLEN NESS CONTROLS INTERNAL THROTTLE FROM EXILE CYCLES WITH ARLEN NESS GRIPS 21" TWSITED DIAMOND SPOKE WHEEL WITH HHI 6 PISTON CALIPER WITH A 13" SPOKE ROTOR WITH EDDIE TROTTA DIAMOND CUTT CANS WITH ALL CHROME LEGS WITH HIDDEN AXLE ALL THE FLOOR BOARDS AND SHIFTER AND BRAKE PEDAL ARE EDDIE TROTTA DIAMOND CUT SERIES THE FRONT AND REAR FENDERS HAVE BEEN EXTENDED REAR TAIL LIGHTS ARE LED BULLETS THE PAINT JOB IS A ONE OF A KIND CANDY AXALTA PAINT JOB WITH PIN STRIPING AND LEAFING. 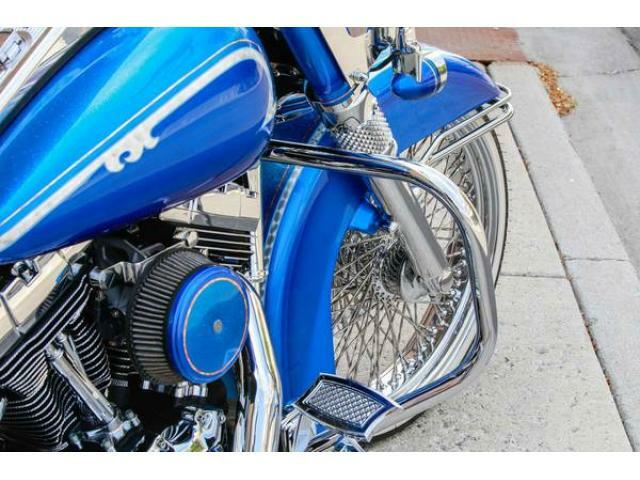 THIS BIKE IS IMMACULATE IF U HAVE ANY QUESTIONS PLEASE CALL OR TEXT NO REASONABLE OFFER WILL BE REFUSED.